Since almost everybody already knows and have an opinion about pizza, this "recipe" is more of an article. It makes it a little easier to argue and tell the background behind the choices I have made with my actual recipes. In my opinion the best pizza has a thin crust that just needs 2-3 minutes in a 600°C (1100°F) degree hot stone oven. One you can eat it with your hands and where the filling does not drop off. If you are starving you just have to eat some more pieces. However, I have no brick oven so I I've found some techniques to make them almost as good in a conventional home oven. Complex tomato sauce - It has more flavour nuances than the simple, but it takes longer to make. So make a large portion and put the rest in glass and save for later. For pasta. Or more pizzas. Slow fermented - wet dough - No knead pizza dough. The best you can do. Does not require much work, but does require that you are cool with starting the day before. Quick - medium wet dough - A kneaded dough that most of us do, because we are too lazy to start the day before. It is by far the most easy to do with a mixer as it should be kneaded quite a lot. But you can also knead it by hand. I made recipes for some variations, depending on how far in advance you are able to make your dough. We now practically only know pizza with tomato sauce and all sorts of meat filling, but pizza started out just as a bread with fat, and then a few extra ingredients to give it some flavor. Personally, I prefer pizza as an accompaniment to other foods. Bread with taste, so to speak. So a good olive oil, some herbs and some salt, then I'm happy. When we eat pizza in my family the reigning king is the margherita with a little bacon, prosciutto ham, pepperoni or small chunks of minced beef. Onions, pepperoni, smoked cured ham (Schwartzwalder is my favorite), bacon, tomatoes, peppers, anchovies, minced beef. 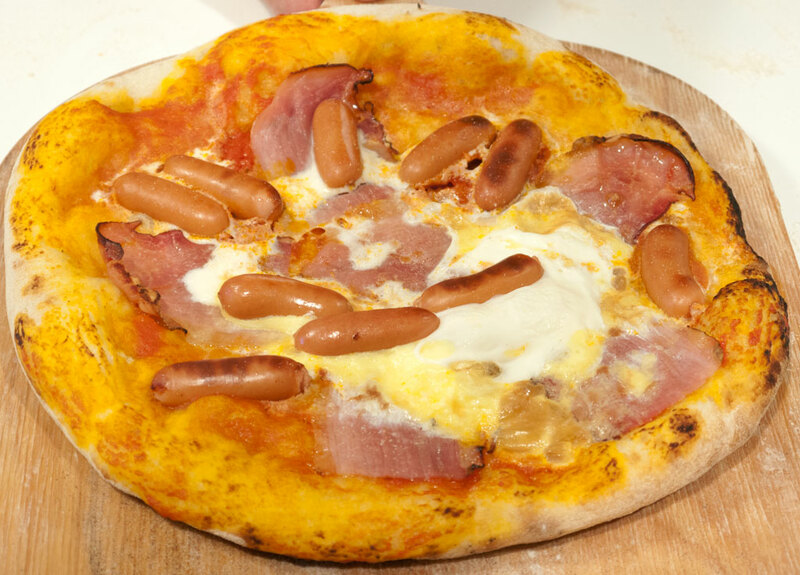 Furthermore, I can recommend a breakfast pizza with tomato sauce, cocktail sausages, bacon and an egg cracked out in the middle of the pie. That's just what any healthy boy and girl need to start the day. 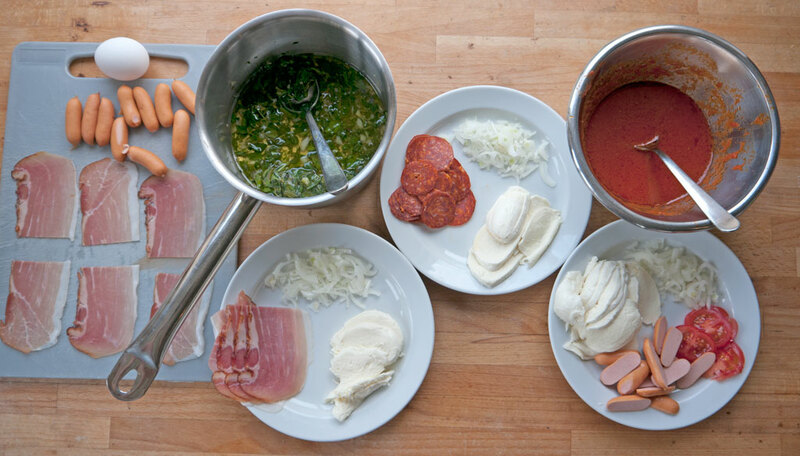 But if you need inspiration for toppings you can always look a pizzeria menu through. Just remember that the topping on a thin pizza must be finished at the same time as the crust. That's why you usually must use thin slices in a single layer of whatever you choose to pile on. It is worth remembering that pizza and focaccia, for a long time, was just the same. Just with different names in different parts of Italy. 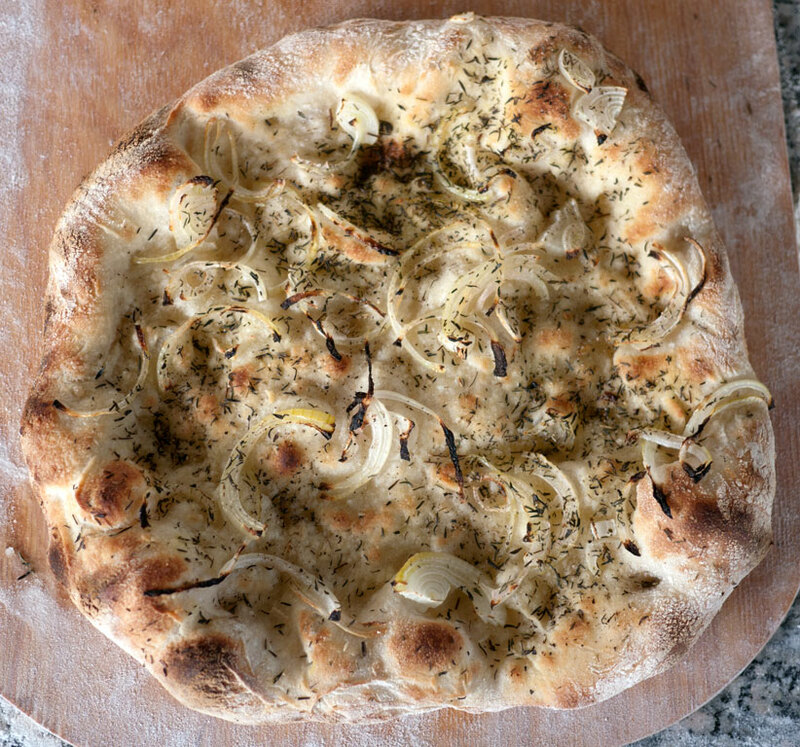 On today's focaccia the tradition is to just use a spicy oil and salt. Which is really good pizza. Grated Swiss type cheese can be used for pizza. However, it should be a relatively mild and fresh cheeses which has not fermented a long time. The pizza should not be overwhelmed with the taste of cheese. The so-called "pizza topping" sold, already grated, and in small plastic bags, you should stay away from. It is an industrial product that usually has nothing to do with cheese! The best you can get is use buffalo mozzarella. But it is expensive and difficult to obtain. You must usually go to a specialist shop with cheese. Cow mozzarella is the one we buy in the supermarkets. And it is quite excellent. Homemade mozzarella is also an option. I'm working on a recipe and'll make this text into a link when it's finished. I have an article just on that topic. So instead of me repeating myself here, I recommend that you just read that. Pizza is so iconic that I think a bit of its history is fun to know. It started as a poor man's food. And it did start in Italy. To be more precise, in the city state of Naples. But it was a "despised" food by the bourgeoisie. It was seen much like the food from a junk food place is today. Just more unhygienic. Covered in flies and insects. Before 1800 there was not much agreement on what a pizza was. For example, it was also the name of sweet pies. So a cake. In 1500 you could get Pizza Napolitana which was an almond tart. The tomato originated in America which the Spaniards and Italians only first discovered in the 1500's, so that definitely rules out the existence of the modern pizza with tomato sauce, until at least before approximately 1600-1700. When we reached about the year 1800, pizza was also the name of a flat bread made with a heavy leavened dough with fat on top, which was baked crisp. Once in a while there was also cheese, anchovies or other things used as topping. Pizza bakers and regular bakers regularly used residual heat in their wood fired ovens for baking flat bread with a bit of cheap topping. They then sent a bunch of street vendors in the city who sold them for a dime apiece. Or a "Soldo" as they where called it in Italy. In Danish the word for spending money on useless thing is called to "solde". An accident? I think not. There was also dedicated pizzerias in that period. The white bread was only introduced for the lower classes during industrialization. That is the end of 1800. It simply required too much manual work to sieve all the rough parts of the meal when it was ground. Therefore, the first pizzas must also have been made from whole wheat bread. So if you are a purist, you can safely make your "classic Italian style" pizza of wholemeal. It has also been common to top them with the cheapest ingredients. Fat, herbs, vegetables, etc. It was food for the poor, and the trick was getting flavor into the bread at a low price. 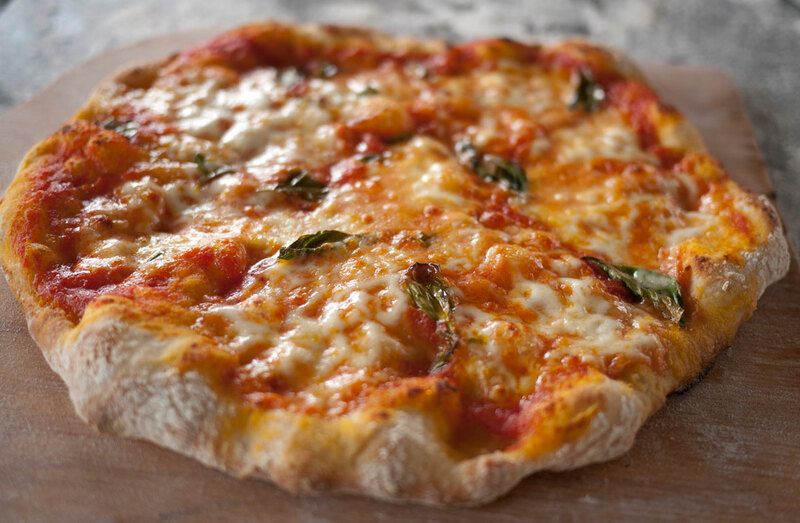 There is a bit of uncertainty about how the classic "Pizza Margherita" began, but in 1889 Queen Margherita of Savoy was on a month long visit to Naples. The local pizzeria owner Raffaele Esposito sent 3 kinds of pizza to the Queen. One with oil, one with anchovies, and one with tomato sauce, basil and mozzarella. She thanked nicely for them in a letter. 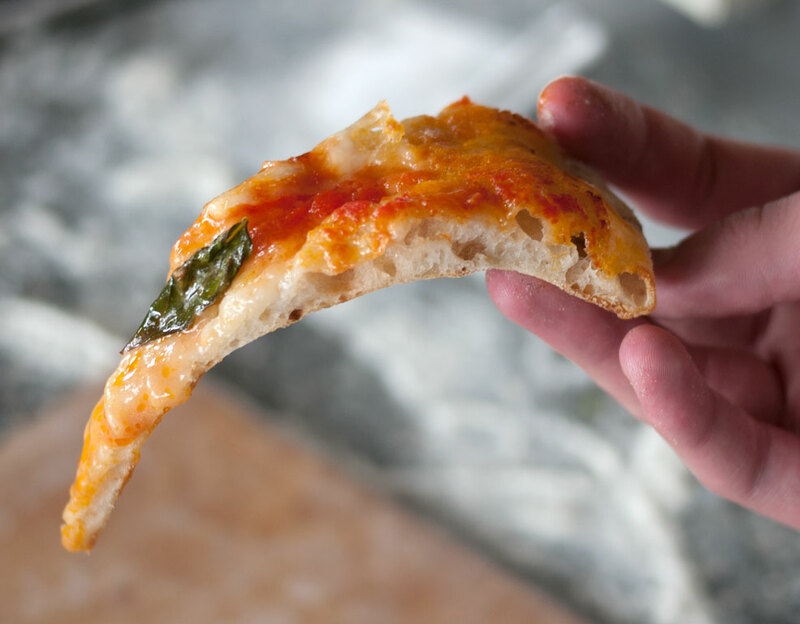 The letter still exists in the pizzeria, which is now called "Pizzeria Brandi"
Pizza with tomato sauce, mozzarella and basil was then named after the Queen. Because rumor has it that it was the one she liked the best. The red, white and green colors are also the same as the Italian flag. Which probably has helped pushing the myth. There should be a law against putting pineapple on your pizza.